The W & P revolves around "The Ringing World"
The 20th Annual Dinner took place on 29th April at The Potter's Heron Hotel, Ampfield, Nr Romsey, attended by 67 members and guests. The Master, Fr. Barry J. Fry, welcomed the Bishop of Southampton, the Rt. Rev. 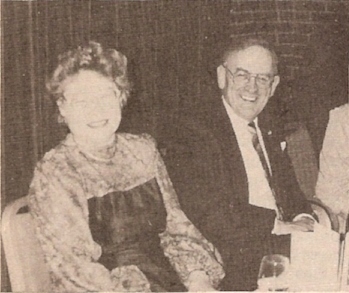 John Perry, and his wife, other speakers and members. In his speech proposing the toast to the Guild the Bishop said that a new world, that of bell-ringing, was being opened up to him because during 18 years of parish ministry he had not had the opportunity to be associated with a church containing a ring of bells. Now The Ringing World was literally seated on his right - Mr. David Thorne! The Bishop perceived there was a spirit of fraternity and harmony within the Guild, and this reflected the needs of the instant society in which we live, for without harmony there is chaos. He observed that ringing keeps one young and fit. The Bishop of Southampton and Mrs. Perry. Mrs. Gilian Davis, the Immediate Past Master, said she was proud to respond to the Bishop and appreciated his interest. During her time as Master she had guarded the reputation of the Guild, now 110 years old, and endeavoured to combine tradition with innovation. The latter was a reference to the experimental period of graded ringing assessment which was not continued. She observed that the achievements of modern ringers should be carefully monitored. 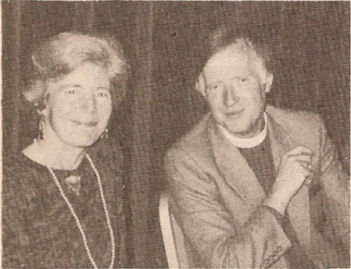 Although she had been the first lady master she noted that the first two masters had been clergymen; the next master, George Williams, held office for 30 years, so she asked if the present one was considering the same length of time, but she stressed the importance of maintaining mutual respect between clergy and ringers. Mrs. Gilian Davis and David Hughes. A short interlude followed with three leads of Oxford Treble Bob Major rung on handbells by Mrs. Gail Cater, Messrs. John Croft, Andrew Craddock and Roy le Marechal. Charles Kippin finds the R. W. more interesting than the company! Mr. David Hughes, Tower Captain at Liss (not the Campanile, although uncle of Martin and Stephen Hough) welcomed the visitors, the Bishop and his wife, Mr. and Mrs. David Manger from Frittenden, Kent, who earlier in the day had judged the 6-bell striking competition in the Winchester District, and Mr. David Thorne, Editor of The Ringing World. Mr. Hughes recalled that after an initial panic when asked to propose the toast to "The Visitors" he reflected that he was only the third member of the Alton and Petersfield District to have been accorded this privilege. He was also the first W & P member to know David Thorne, so had been able to "vet" him for the post of editor when Charles Denyer retired because of his own work in the printing of the journal. The Master gave David Thorne a copy of the 1979 Ringing World which featured the Centenary of the Guild and a new Guild tie. This night was the first time the newly-designed ties were on sale to members, and a brisk business was done before dinner took place. 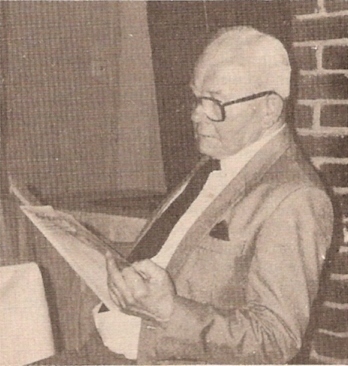 Mr. Thorne said he did not enjoy making speeches but recalled he had attended a W & P dinner in 1982, and since then 7,300 pages of The Ringing World had been published. He gave an interesting account of the daily running of the office and the liaison with Seven Corners Press, particularly paying tribute to David Hughes who occasionally had to advise the Editor! The Master concluded the evening with a vote of thanks to Mrs. Margaret Aylieff and members of the Social Committee who had arranged the evening.